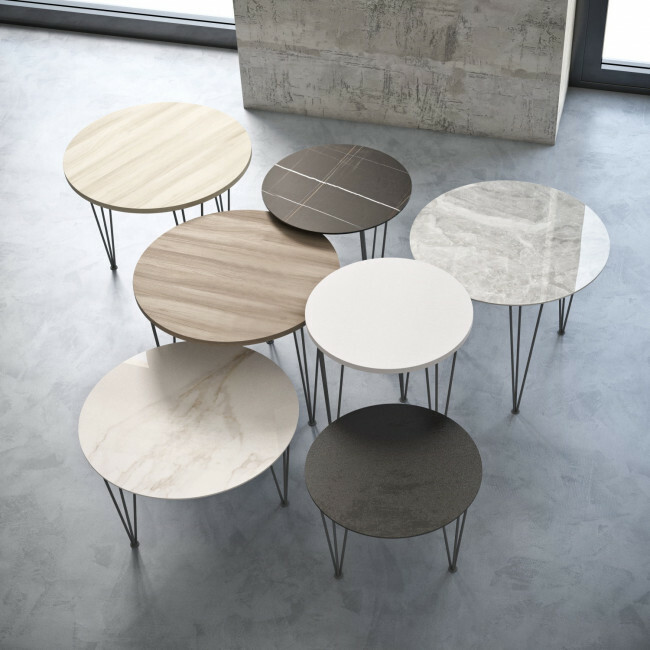 Piramide Gres is a porcelain stoneware coffee table characterised by a thin metal structure. It is available in a low model - 35 cm - or high - 49 or 52 cm - with round top in two sizes cm Ø 46 or 59. More in detail, the top is composed of a stoneware thin layer with an effect very similar, for looks and resistance, to a precious material such as marble. 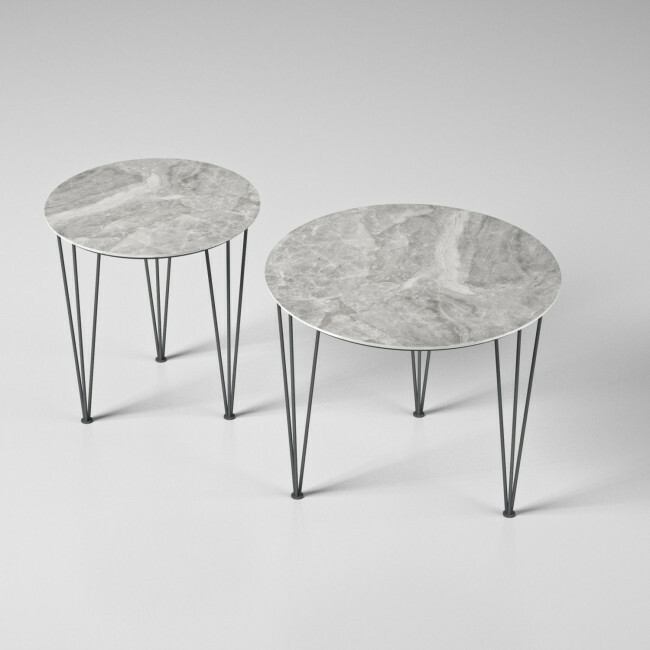 The three legs are made of three charcoal black painted metal tubes each, these stand on a very small supporting plate. 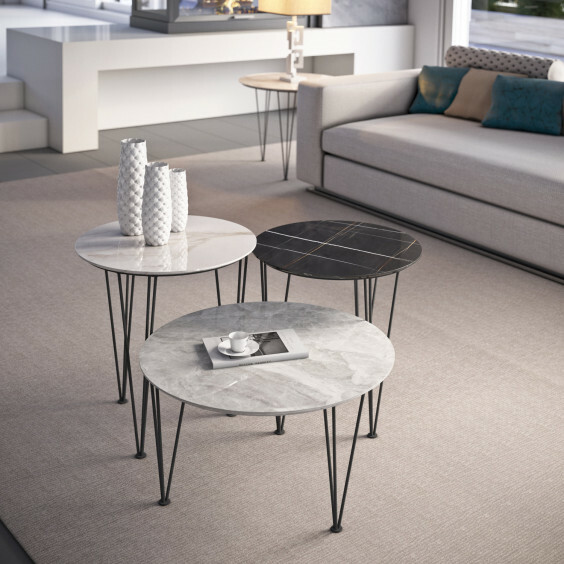 The marble effect top can be chosen in four variants: polished White Gold, polished Sara Noir Black, polished Orobico Gray, matt Natural Iron. The texture of the white stoneware reminds the one of precious Calacatta marble, the Orobico Gray top has white and grey shades wheres the polished black has a pattern made up of white veins and golden streaks, lastly Natural Iron top is characterised by a dark intense colour. The stoneware top is exceptionally resistant and sturdy, this strong aspect is counterbalanced by the lightness of the metal base resulting in an overall refined look. Piramide Gres is modern and elegant, it can be matched with luxury sofas and armchairs but, according to the finishes, it can easily fit also in younger and more informal areas. 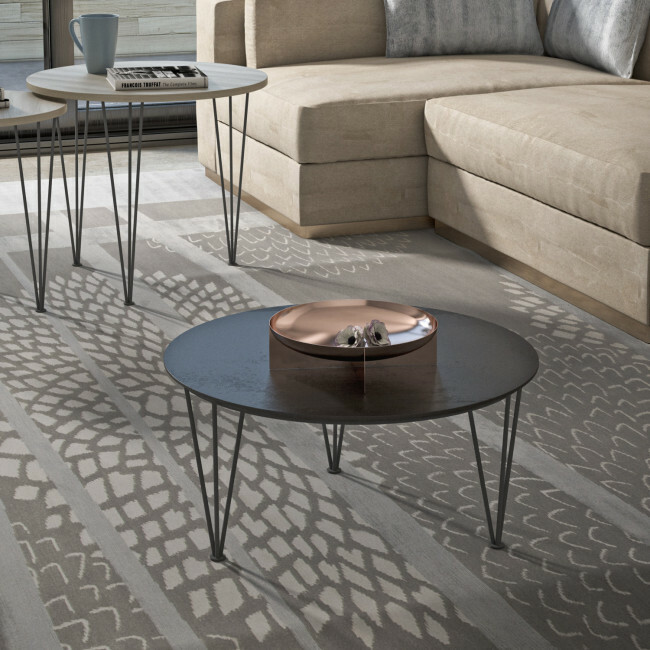 This coffee table can also be used to furnish hotel halls, waiting rooms and relax areas in commercial premises. Piramide Gres can be used alone or matched with other units to move around when the need arise. Top: polished White Gold / polished Orobico Grey / polished Sara Noir Black / matt Natural Iron stoneware. Piramide Gres coffee tables with marble effect porcelain stoneware top belong to Maconi Coffee Tables collection. By visiting our shops and Partner Retailers you will receive professional assistance in creating the perfect furniture solutions for your own space. You can find all customization possibilities by using the configuration menu.